Sensational footage has emerged of a monster 12ft alligator making its way across marshlands at a protected area in Florida, as amazed onlookers capture a glimpse of the massive reptile. 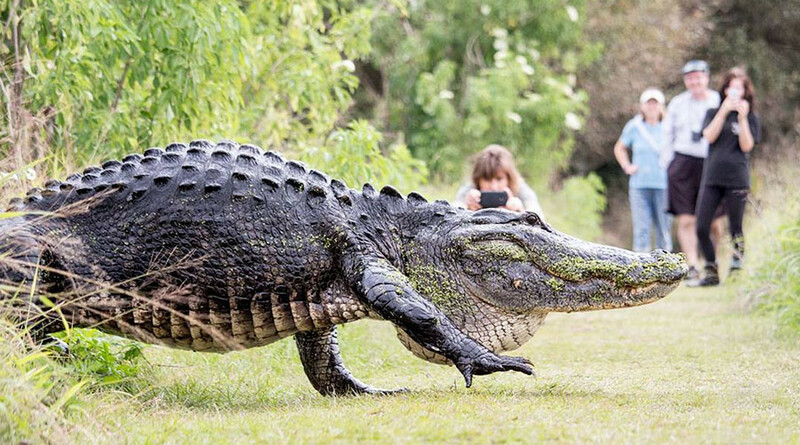 The gator, nicknamed ‘Humpback’ on account of its large curved back, is seen slowly stepping across a clearing at the Circle B Bar Reserve in Lakeland in the Sunshine State. “I love Circle B. Nature at its best,” said Kim Joines who posted the video to Facebook after her rare sighting of ‘Humpback’ on a recent visit to the reserve. Florida is no stranger to large reptiles. Last year an even bigger alligator was seen strolling across a golf course in Palmetto.